For the new commander in chief, it was “sobering” to be briefed that morning on the unparalleled destructive force now at his fingertips. “Very, very scary, in a sense,” he said in an interview. Like every US president since the dawn of the atomic age, Trump, upon taking the oath of office, gained sole authority to initiate nuclear war. No other US official need approve his decision. But implicit in her warning, and in so much of the commentary on the perils of Trump and nuclear weapons, is the notion that there are safe hands for these ultimate instruments of terror and destruction—that certain individuals, Clinton included, are wise and judicious and rational enough to decide when it’s acceptable to incinerate civilians indiscriminately and on a massive scale. As the media have often noted, Trump won’t rule out one day launching a nuclear strike—though this is hardly surprising. Obama, who earned himself a Nobel Peace Prize for his intention to pursue disarmament, had also kept open the possibility of waging nuclear war, and ignored repeated calls by former military leaders to adopt a policy never to be the first to use a nuclear weapon in a conflict. One cannot sensibly reject nuclear weapons for Trump—or North Korea’s Kim Jong-un, Russia’s Vladimir Putin, or any other pugnacious head of state—while accepting, even embracing, them for those with friendlier faces. 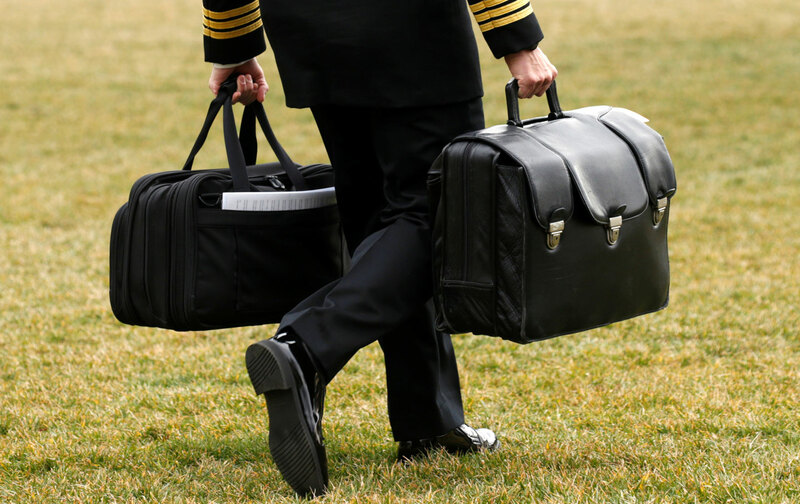 Democracy doesn’t afford public servants the choice to keep nuclear codes from a president whom they deem too impulsive or ruthless or irrational to have them. This, many arms control experts said, signaled a fundamental shift in US policy on nuclear weapons. But did it? Such rhetoric is unquestionably more bellicose than Obama’s. Yet, the Nobel-decorated president, contrary to perceptions, was never a true champion of disarmament. In his two terms in the Oval Office, he dismantled many fewer nuclear warheads than did either president Bush. But the liberal media in the United States and elsewhere applauded this speech, for it described the vision of one day—“perhaps not in my lifetime”—eliminating nuclear weapons. Obama was an intelligent, moderate leader. Thus, few seemed terribly concerned when he rendered that goal more distant. Focused on curbing nuclear proliferation in Iran, he failed to grasp the danger of a nuclear-armed America. As a state party to the 1968 Nonproliferation Treaty, the United States is legally obliged to pursue negotiations “in good faith” for nuclear disarmament. It must, moreover, refrain from any action that would undermine that objective. It was on the basis of this commitment that other nations forswore nuclear weapons. Almost half a century later, many are now angry at the lack of progress toward elimination. While the United States has indeed negotiated various arms-control accords with Russia (and the Soviet Union), these have done little to diminish the role of nuclear weapons in either nation’s military doctrines. Thousands of warheads (those deemed obsolete or superfluous to needs) may have been shed from stockpiles, but both states are today as committed as ever to maintaining their nuclear supremacy. Ban Ki-moon, in his time as secretary general of the United Nations, often said, “There are no right hands for wrong weapons.” Much to the chagrin of the permanent members of the UN Security Council—all of which possess nuclear weapons—he rejected the idea of responsible nuclear powers. The problem, he said, is not who has these weapons but the weapons themselves. Today Trump commands several thousand nuclear warheads because presidents before him failed dismally to advance disarmament, and in most cases greatly enhanced the US arsenal. He has the capacity to destroy all of civilization because the international community, seven decades into the nuclear age, still has not agreed that these weapons are unacceptable for all. But at the UN next month governments will embark on a process intended to change that. They will begin negotiations for a treaty prohibiting nuclear weapons, comprehensively and universally—a treaty to place the bomb on the same legal footing as other inherently indiscriminate and inhumane weapons, from chemical and biological agents to anti-personnel landmines and cluster munitions. In all likelihood, the Trump administration won’t participate in this process. Indeed, last October, ahead of a UN vote to establish the negotiating mandate, the Obama administration had declared its opposition, instructing all US allies to do likewise. But the vast majority of nations are undeterred—convinced that, as a matter of principle, weapons designed to inflict catastrophic human harm ought to be banned. Any nation that values international law, that seeks to uphold humanitarian principles and prevent the unraveling of the nonproliferation regime, must work to create a robust, effective accord. For US allies to follow Trump’s lead in boycotting this process, as they have contemplated doing, would be grossly irresponsible—especially at a moment of great global instability and tension. No one is under the illusion that prohibiting nuclear weapons will guarantee their elimination. But it is a necessary and urgent first step. History has shown that bans on other weapon systems facilitate progress toward their abolition. Arms that are outlawed are increasingly seen as illegitimate, losing their political status and, along with it, the resources for their production and modernization. A ban on nuclear weapons would be a declaration by the world’s nations that no leader, whatever his or her character, should decide the fate of humanity, that it is as wrong for the United States to possess nuclear weapons as it is for North Korea or Iran to seek them. As the minute hand of the Doomsday Clock ticks closer to midnight, the UN negotiations offer a glimmer of hope for a saner, safer world. Tim WrightTim Wright is Asia-Pacific director of the International Campaign to Abolish Nuclear Weapons (ICAN).